Ask any Australian what they think about giving anything a fair go, and they’re likely to tell you that anyone or anything, as long as it isn’t hurtful or unjust, deserves that right. It is based on this same concept that the Australian Taxation Office is reminding everyone to give the tax system its fair go and comply with due diligence and honesty to their tax obligations. 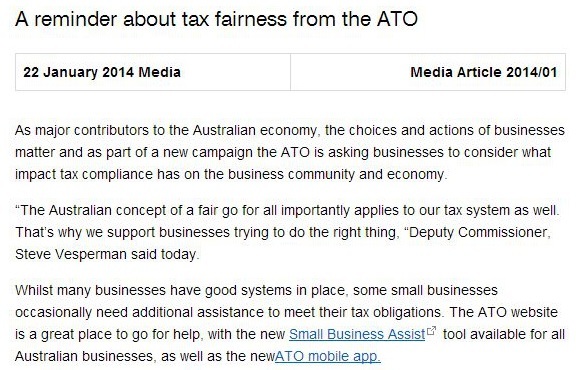 The reminder comes with new research from the ATO that suggests that small businesses agree that paying goods and services tax is important and is the right thing to do. The same research found that around two thirds of businesses would report anyone they knew evading paying tax to the ATO. It also found that majority of businesses didn’t think that tweaking numbers on their business activity statements would help them financially. As a significant segment of the small business sector, it wouldn’t be incorrect to assume that a large portion of doctors feel the same way about paying their taxes as the ATO’s research suggests. It is in this regard that hiring a professional medical accountant from a respected firm, like MEDIQ Financial, is important to any upright doctor’s business. Medical accountants in Melbourne act as direct enablers of tax fairness for the doctors who utilize their services. Taking their skills and experience in preparing business activity statements and goods and services taxes for lodging, they help doctors file the correct amount of tax so they can fulfil their obligations, not just to the ATO, but also, as tax-paying citizens, to the nation as well.